The right choice for index tabs... excellent service... top quality and... great price! Blank tabs are used on copiers. The benefit of blank tabs is they can be inventoried at your location and imprinted by you on-demand. Order on-line now, prior to shipment we will contact you to securely obtain your credit card account information. 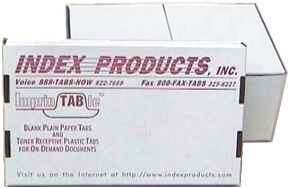 Index Products provides blank tabs in cases of 1250 tabs. Our blank tabs are always available within one working day of your order. This includes custom cuts. Another advantage we offer as a manufacturer is custom collated index tab sets... have you ever had a need for 7 tabs, only to be left with 3 unused tabs? We can provide custom collated sets of tabs (any number of tabs) to help you avoid wasting costly tabs...call us at (888) 822-7669 and we can determine the custom collating configuration to best fit your needs! 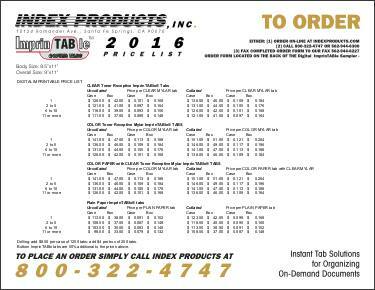 As a manufacturer, Index Products offers blank tabs directly to you at extremely competitive prices. If you prefer to speak to an Index Products representative call (888) TABS-NOW, that's (888) 822-7669. Collation is available in straight sequence, reverse sequence, and double reverse sequence. Custom collated sequences are also available. Every case of our ImprinTABleTM copier tabs is packaged with 5 interior boxes, each with 250 tabs. The packaging is designed to prevent damage during shipment and ease of handling once the product arrives at your location. If you use copier tabs, save money with our ImprinTABleTM product line. Order a case or more today!